One of the main reasons for integrating the memory controller directly into the processor is because latency decreases between the two devices - cpu and memory controller. The downside to integrating the memory controller into the processor is that it makes big platform upgrades and adopting new technologies rather more complex. I'm not talking about going from one CPU generation to the next, but migrating from one platform to the next. With a conventional system where the memory controller resides within the Northbridge chipset, moving from say SD-RAM to DDR (or DDR-2 to DDR-3) really only requires some new memory and a motherboard with the appropriate chipset. In the case of AMD's very successful Athlon64 processor, the same reasons it has become so popular also ensure that this kind of platform evolution is essentially impossible without replacing the processor itself. AMD is on the cusp of dropping DDR and adopting DDR-2 RAM, and this is why the socket AM2 Athlon64 processor is being introduced in June 2006. This impending change is having a very interesting impact on memory producers, and it is clear that DDR-2 specifically geared towards the particular sensitivities of the Athlon64 processor is ever so slowly creeping onto the market. At the moment most DDR2 memory is geared towards Intel Pentium 4/D/XE processors which are not especially sensitive to CAS latency timings. What that means is current DDR2 memory is more geared towards high speeds with loose latencies, exactly what the Intel Netburst architecture requires. In preparation for AMD's Socket AM2 Athlon64 processors, memory manufacturers have begun to tighten up DDR2 memory timings, and this is a really wonderful change in our opinion. Patriot Memory has been trailblazing some new paths for flexible DDR2 this year; memory that can run at multiple speeds with multiple CAS latency settings. This versatility makes it possible to apply a single pair of DDR-2 in a couple different ways. For example, with the module we're testing today we can loosen up the timings and clock the memory sky high for an Intel Pentium 4-based computer system. In a couple months time we'll be able to pop this DDR-2 into an AMD socket AM2 processor-based rig and run the memory slightly slower, with really tight CAS Latency timings. Basically, what we have here are latency settings married to the agility of the next generation AM2 Athlon64 CPU, and clock speeds in step with the cravings of a dual core Intel Pentium D processor. The Patriot PDC22G8000+XBLK Rev.2 memory is a "jack of all trades" DDR-2 module. 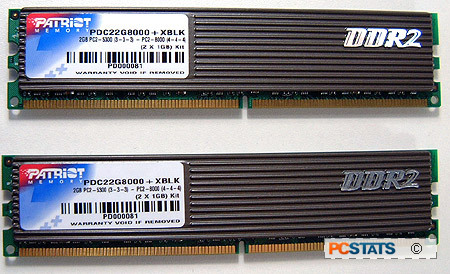 This pair of dual channel DDR-2 RAM is capable of running with timings as tight as 3-3-3 under DDR2-667 (PC2-5300) speeds, and with timings as tight as 4-4-4 under DDR2-1000 (PC2-8000) speeds... Yes you've read that right, the PDC22G8000+XBLK memory isn't married to those all too familiar 5-5-5 CAS Latency settings. PCSTATS is giving you this exclusive first look at what Patriot will be introducing into the market at the end of this month, and from what we're about to show you it's looking pretty enticing. The memory is virtually identical to the Patriot PDC22G8000ELK memory that PCSTATS previously tested, although these modules are capable of the same speeds at slightly improved latency timings. Each 240-pin DDR-2 memory module is 1024MB in capacity, and draws the standard 1.8V from the DDR-2 DIMM slot. There are eight BGA DRAM modules per side, and Patriot protects the Patriot PDC22G8000+XBLK Rev.2 with aluminum heatspreaders. Patriot knows that potential buyers will be overclocking these babies quite heavily, and it adjusts its warranty accordingly. For instance, DDR2 voltage can be increased up to 2.3V without invalidating the warranty. Patriot's level of customer service is also pretty good. The company offers online help covering installation, BIOS optimization and trouble shooting. If you'd like to do things the old fashion way you can give them a call and speak to a tech support person. Pg 2. Ready, Set, OVERCLOCK!